Thailand, especially Bangkok has been in political turmoil for a few months now. However, since last Tuesday, the situation really elevated to affect the aviation in the country. Suvarnabhumi Airport and Don Muang Airport in Bangkok have been seiged by the anti government protesters! The airport authority had decided to close the airport since Tuesday (26th November 2008). Little do I know about politics. So, I am not going to write anything political. From the recent protests and demonstrations, I can see that Thailand is a colour coded nation. Why do I say so? Thai people are very obedient when it comes to being told what colour to wear. First of all, we of course have to start from wearing yellow shirt on Monday for HM the King. This new tradition has been started since the celebration of the 60th Year anniversary of the King on throne. 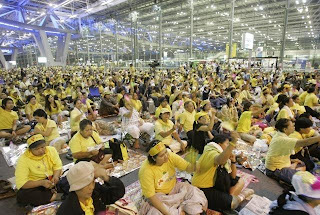 And a few years later, today, many Thai people still wear yellow on Monday for the King. Why Monday? Because HM the King was born on Monday. However, on Tuesday, Thai people wear light pink to wish HM the King good health. Next, Thai people also wear light blue for HM the Queen. However, sorry that I do not know which day people where blue for HM the Queen as it is not as widely worn. Two weeks ago, Thai people wore black or white during the mourning period (3 to 5 days) of the late Princess Ghalyani Vhadana. I have written about that weekend in my previous blog posting. 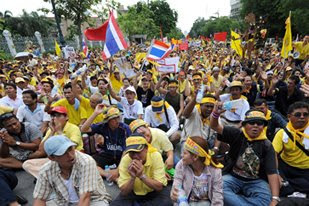 Recently, we can see a lot of anti-government protesters wear yellow during demonstrations and protests. I wonder why do they choose yellow since it is the colour for HM the King. As for the pro-government supporters. They wear red during their gathering in a stadium. 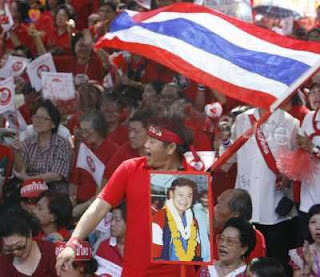 When I saw the pictures of the pro-government supporters, it’s like a sea of red chilly! So, living in Bangkok, I have to be careful of what I wear. Recently, I won’t wear anything yellow or red. Well, actually, I have neither colours in my closet anyway. So, I shouldn’t be worry unless a new group of protesters decide to wear black or blue. Then I might be in trouble.